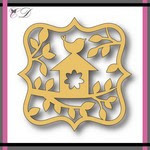 Gloria here today, I want to share with you a card using a birdhouse die from Cheapo dies. Here’s a look at my completed card. Here’s a closer look at the cute die cut. I cut the main piece of the bird house tag using wood grain white card stock. I adhere the bird house onto a craft card stock square and mounted all elements as shown a top-folded card using double-sided tape and foam tape. Beautifully created Gloria, and a fabulous use of the die!